Home / Brooklyn / Brooklyn GOP / Brooklyn GOP Radio / Gene Berardelli / Joe Lhota / John Catsimatidis / NYC Mayor / People's Republic of New York / Rudy Giuliani / Russell Gallo / Who Running For Mayor, Anyways? Who Running For Mayor, Anyways? Did I miss something? Did Rudy Giuliani throw his hat in the ring to once again be Mayor of NYC? You would think so, if you saw these ads as I did. 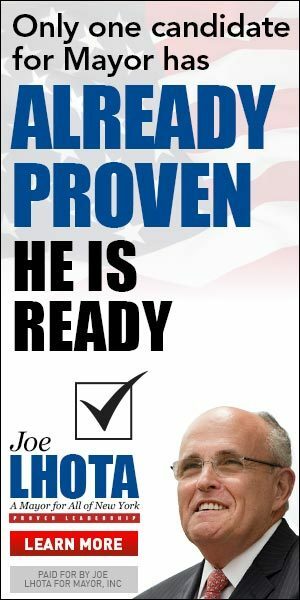 As I was making the rounds on various conservative-leaning websites as I do from time to time, I saw these two ads for Joe Lhota for Mayor - at least they have his name on it. But where's Joe? Did he get cropped out of his own ad?!? It seems that the "Lhota Game Plan" is to be a "generic" candidate riding Giuliani's coattails. It's one that many candidates have tried, with little success. 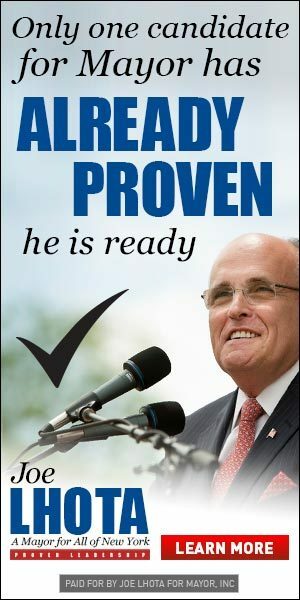 I do agree with this ad in one way - Rudy has indeed already proven he is ready for Mayor. Wish I could say the same for Joe Lhota, who can't even face Republicans in his own ads! Where is my Poem Gene titled America it stated that you have to approve of it or are you guys now against me? Rudy is running for mayor. He is using Joe Lhota. I quote my boss and Rudy told everyone present lets go guys and lets see if we can clean this mess up in a week. Rudy did not have a clue then and Joe Lhota his side kick is just as lost. Like rats and he is clueless, they bait them and the rats get use to the bait and besides the passengers feed them. I have the answer and gave it to them 20 years ago and it was at an MTA Board meeting which I use to attend as an hourly employee and they told me we will look into it. 20 years passed and they are still looking into it. At another board meeting I warned them about closing the vents to the street which gave the subway a natural air flow thru the tunnels and the stations. Again they told me they will get back and research it. 20 years of getting back and they have long forgotten these board meeting or what was said.